Need something new now? Buy what you want today, pay it over four equal fortnightly instalments. Need it now? Shop online, we'll send your order and you pay the items off over 4 equal payments. 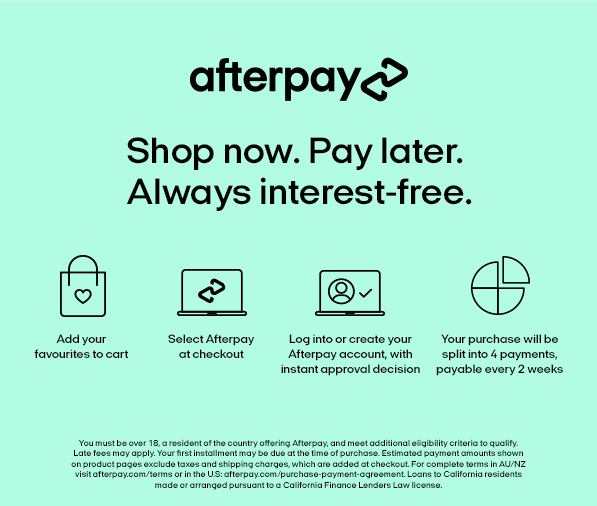 Choose Afterpay as your payment option during checkout. Quickly log-in or create an account using your existing debit or credit card, and receive instant approval. Pay over 4 equal payments, every 2 weeks. If you're a first time customer, you will need to create an account, so have your email address, mobile number, payment and address details handy. Returning customers simply log-in to make a purchase. Afterpay will split your payment into four equal instalments, due every fortnight. For example, if you spend $100, each instalment would be $25. You'll see all the details in checkout! Your order will be sent immediately, and Afterpay will take care of the rest. At any time, you can log in to your Afterpay account to see your payment schedule or make a payment before the due date. Otherwise, your instalments will be automatically deducted from your nominated debit or credit card every fortnight. Items purchased online using Afterpay may be returned for a refund by posting it to our Online Store Returns/Exchange address or exchanged in store for an alternative item or gift card. Gift cards will also be issued for any difference between the item exchanged and the amount originally paid. We are unable to issue refunds in store for orders placed online with Afterpay. All refunds and exchanges are subject to our refund and exchange policy having been met. Seen something you love? Shop in store, take the items home with you, and pay the items off over 4 equal payments. Quickly log-in or create an account using your existing debit or credit card. Present barcode at the register, and we'll scan it to update the final purchase total. The first of 4 equal payments will be deducted on the day and every two weeks thereafter. The Afterpay in-store process starts from your mobile phone and takes a minute or two to complete. Simply download the Afterpay App from the App Store or Google Play. If you're a first time customer, you will need to create an account, so have your email address, mobile number, payment and address details handy. Returning customers simply login. Tap the barcode tab in the app and you'll automatically see the maximum amount you can spend in-store and a barcode. Present the barcode at the register to be scanned when it's time to pay. Make sure you have 25% of the total purchase price available in your account, as Afterpay deducts your first payment immediately. Items purchased in-store using Afterpay may be returned for an exchange or refund in-store, subject to our refund and exchange policy having been met. Refunds will be processed back to your Afterpay account.